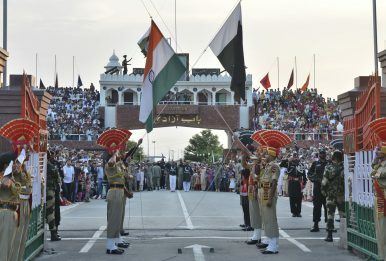 In this July 21, 2015 file photo, Indian and Pakistani flags are lowered during a daily retreat ceremony at the India-Pakistan joint border check post of Attari-Wagah near Amritsar, India. The ruling BJP is keen to tamp down anti-incumbency sentiments – and one way to do that is playing the Pakistan card. The 2019 Indian general election is a few months away, and political parties in India are busy drawing battle lines on various issues of national importance. Most of the issues on the agenda relate to domestic concerns since matters related to foreign policy have traditionally been relegated to the background during election campaigning in India. But there is one notable exception — the relationship with Pakistan. Pakistan has long been addressed in the election manifestos of the major political parties in India. In 2014, the election manifesto of Indian National Congress stressed the party’s commitment to improve relations with the neighbor while holding Pakistan’s government accountable for the 26/11 attacks and putting pressure on Islamabad to eliminate terrorist activities in Pakistan. On the other hand, the Bharatiya Janata Party (BJP) underlined in its 2014 election manifesto its commitment to address the demands of refugees from Pakistan Occupied Kashmir (POK). Pakistan is undoubtedly a subject of relevance in the electoral politics of India and this trend will resurface in the 2019 general elections too. The anti-Pakistan sentiments have flared in India in the past five years on multiple occasions, prompting many of the members from the BJP to perpetuate such sentiments overtly. One common line of attack is to openly ask dissenting voices to “go to Pakistan.” On one occasion, BJP Yuva Morcha (the youth wing of BJP) even denounced the former minister of state for external affairs and a present Lok Sabha member, Shashi Tharoor, urging him to go to Pakistan over his criticism of the Modi government. The Pakistan factor becomes more apparent while analyzing the political atmosphere of Jammu and Kashmir. Any time an Indian soldier dies in a cross-border attack or a militant raid in Kashmir, politicians are very quick to weaponize the outrage in order to attack the incumbent government. Regardless of who is in power, the opposition always bats for a “harder line” on Pakistan, and this resonates with the average Indian voter, who has always been deeply suspicious of Pakistan. As a result, the ruling party in India is always wary of appearing too compromising when it comes to Pakistan, for fear of inviting the wrath of both the opposition and the voters. With just a few months to go before the general elections, it appears as though the BJP government is reluctant to engage in any concrete manner with the newly elected government in Pakistan. The fear is that any such dialogue or cooperation would be pounced upon by the opposition to attack the center for “going soft” on Pakistan. Pakistan’s new Prime Minister Imran Khan has made several offers for talks, but these have been repeatedly rebuffed by India, which continues to maintain its earlier position that talks cannot happen as long as Pakistan-sponsored terrorism continues unabated. At the moment, there seems very little chance of an improvement in Indo-Pak relations before India’s polls in May 2019. The ties between the two countries continue to be marked by intense suspicion and hostility. All of this is exacerbated by media houses in India as the debates on Pakistan in many of the Indian news channels are often full of vitriol, exhibiting a lack of nuanced, reasoned discussion. Debate over New Delhi’s policy toward Pakistan is more often than not clouded with overused anti-Pakistan rhetoric. The ruling BJP is well aware of the need to curb the effects of anti-incumbency in the run-up to the general election. One way to do this is by stirring up nationalistic sentiments among the people. This is illustrated by the government’s keenness to publicize the military actions it has undertaken to curb Pakistan-backed terrorism. In September 2018, the University Grants Commission (UGC) issued a circular directing all higher educational institutions across the country to mark September 29 as “Surgical Strike Day,” in order to mark the day in 2016 when Indian armed forces conducted a special operation inside Pakistan-administered Kashmir to eliminate militants. A few months prior to this, the ruling BJP had announced it would be withdrawing support for the People’s Democratic Party (PDP), with whom it had been running a coalition government in the Indian state of Jammu and Kashmir. One of the main reasons cited for this decision was the rising number of militant attacks in the Kashmir Valley. This is inextricably linked to Pakistan, as many of these attacks are carried out by militants trained across the border. This decision was once again portrayed as a principled one the BJP took keeping in mind the greater national interest of the country. For the ruling parties in India, any major step toward greater engagement with Pakistan in the penultimate months of their government is a risk. Keeping in mind the suspicion toward Rawalpindi and the trust deficit with Islamabad, political parties in India generally would not take any strenuous efforts to break the status quo during the election period. A step ahead toward normalizing the relationship with Pakistan, if countered by any militant or terrorist attack on India, could be used against the government by the opposition parties, deteriorating the ruling party’s vote bank. Out of this fear, the ruling governments refrain from taking such a step, keeping in mind the lessons of Kargil attack and 2001 parliament attack. Manasvi Shanker Sharma is a former research intern at IHS Markit, where he was part of Jane’s Land Platforms Team and a post graduate research scholar at the Department of Geopolitics and International Relations, Manipal Academy of Higher Education, Manipal, India. A lack of coherence allied with tough talk could prove self-defeating.